If you have a strong passion for taking pictures and you want to start trying out digital photography, then be aware that Brainmeasures, with its highly impressive digital photography certification course, can offer you the kind of help that you need. With the digital photography course offered by Brainmeasures, you can start shaping your future and embrace a very challenging career as a professional digital photographer as soon as you complete the course. This online certification course is extensively developed to ensure that you get the most comprehensive digital photography training possible. The extensiveness of this online photography course increases your chances of understanding all the components, elements and procedures linked to digital photography including the proper use of digital cameras and their composition, Photoshop, location and studio lighting, color correction and management, image archiving, workflow and preparing digital files for final printing and uploading over the web. The online photography class which you can get from Brainmeasures digital photography certification program is also guaranteed to be comprehensive and accurate enough that you can expect to receive a more unique and invaluable insight about the field which will make it easier for you to compete with other world-class digital photographers. As soon as you receive your certificate, you can start embarking into a more enjoyable and challenging undertaking by providing your expert services in the field of digital photography. 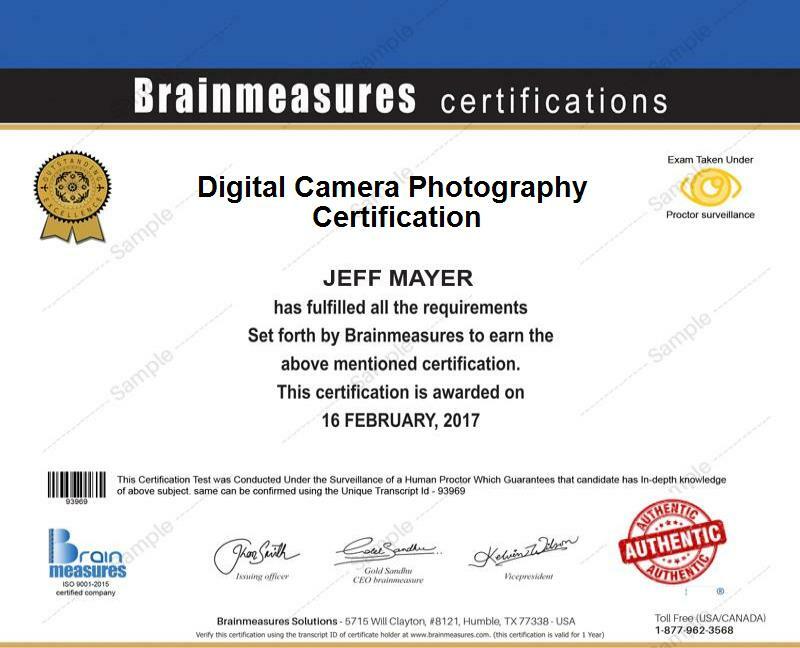 The digital photography certification program offered by Brainmeasures is primarily designed for all aspiring photographers who want to focus more into digital photography and improve their professionalism, expertise and skills especially in effectively executing world-class photography techniques. This is also a good choice for beginners in the field and who have not yet started to shoot in full manual setting. If you are already a digital photographer, then rest assured that the Brainmeasures digital photography certification course is also useful in refreshing and further deepening your skills in the field. Digital photography certification holders can enjoy a more profitable career considering the huge demand for their services. Working as a professional digital photographer allows you to earn around $30,000 to $71,000 per year. Note that your salary will also be fully dependent on the specific event that you are covering. If you want to earn higher as a digital photography certification holder, then you should consider practicing your expertise in wedding events. Digital wedding photographers can earn as much as $226,000 so you should consider trying out your luck in this field.